– small bags of pumpkins/gourds from Michaels (You can probably get these at any craft store or even the dollar store). – spray paint in 5 different colors. I only bought one new can, because I already had the rest in our garage. 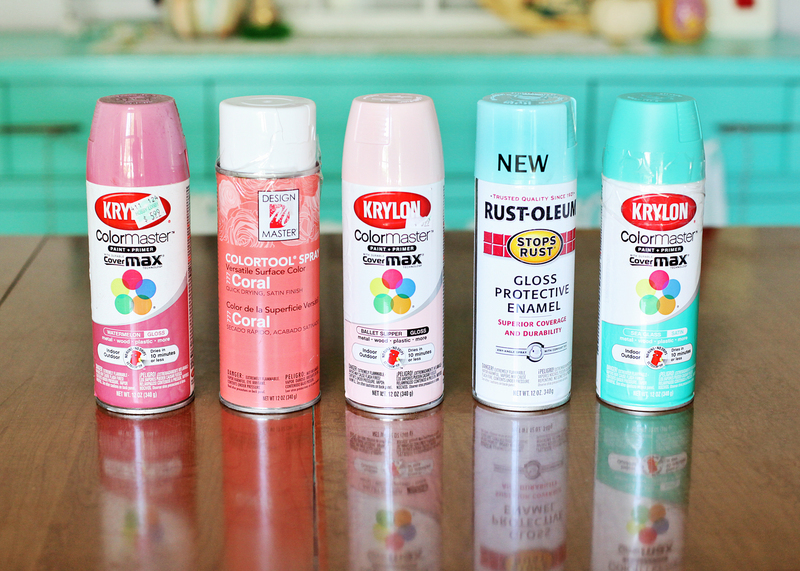 For the record, Krylon is THE BEST. – big piece of cardboard for spray painting. I separated the pumpkins into groups of 3 or 4 and laid them on a huge piece of cardboard in the back yard. Then I sprayed each group a different color. First I sprayed two coats on the bottoms, then flipped them over and did two coats on the top. Finally, I finished them off with a coat of matte topcoat. I did this for two reasons: 1. I love the look of matte paint. 2. All of my spray paints were different finishes, and I wanted them to look uniform. 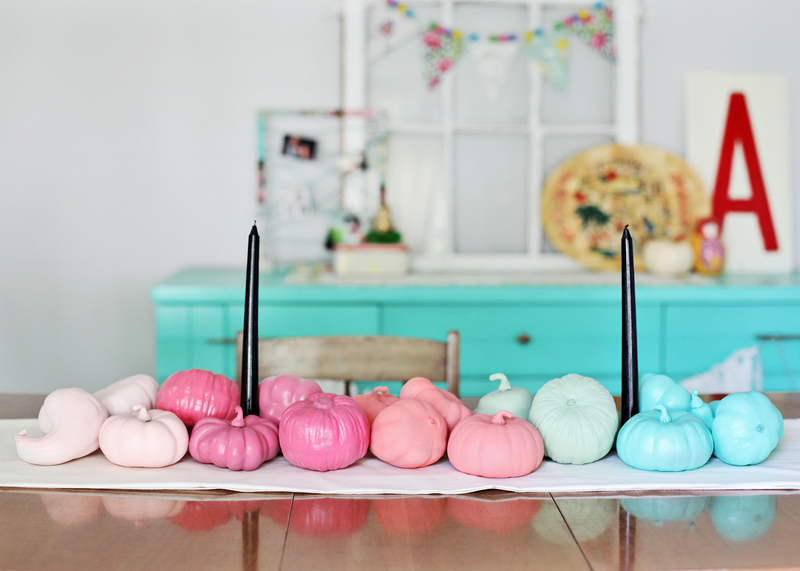 If you look at the pictures of my table you’ll notice that the bright pink pumpkins somehow missed the topcoat and still look really glossy. That’s the look I was trying to avoid, so I’ll give them a coat today! 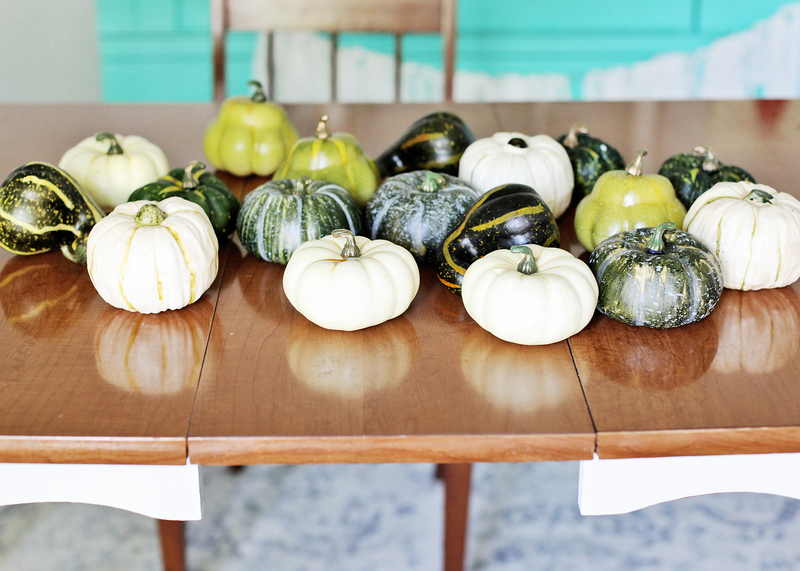 Once all the pumpkins were dry, I brought them inside and arranged them along the top of our dinning room table by color. I didn’t glue them or anything. Just set them down! So easy! To finish off the runner I wedged some black taper candles in with the pumpkins for a fun Halloween look. I think I’ll switch them out for gold ones at Thanksgiving and maybe add some gold leaves throughout. I can see the table from the living room right now, and the colorful pumpkins look so happy! If bright colors aren’t your fall decor style, have no fear! You could easily do this same thing with different metallic shades. Wouldn’t that be pretty?! ?